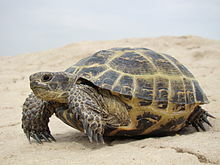 The Russian tortoise (Agrionemys horsfieldii), also commonly known as the Afghan tortoise, the Central Asian tortoise, Horsfield's tortoise, and the steppe tortoise, is a threatened species of tortoise in the family Testudinidae. The species is endemic to Central Asia. Human activities in its native habitat contribute to its threatened status. Both the specific name, horsfieldii, and the common name "Horsfield's tortoise" are in honor of the American naturalist Thomas Horsfield. The Russian tortoise is a small tortoise species, with a size range of 13–25 cm (5–10 in). Females grow slightly larger (15–25 cm [6–10 in]) to accommodate more eggs. Males average 13–20 cm (5–8 in). Russian tortoises are sexually dimorphic. Males tend to have longer tails generally tucked to the side, and longer claws; females have a short, fat tail, with shorter claws than the males. The male has a slit-shaped vent (cloaca) near the tip of its tail; the female has an asterisk-shaped vent (cloaca). Russian tortoises have four toes. Coloration varies, but the shell is usually a ruddy brown or black, fading to yellow between the scutes, and the body is straw-yellow and brown depending on the subspecies. The male Russian tortoise courts a female through head bobbing, circling, and biting her forelegs. When she submits, he mounts her from behind, making high-pitched squeaking noises during mating. The species can spend as much as 9 months of the year in dormancy. In captivity, diet typically consists of lamb's lettuce, plantains and other dark leafy greens. The diet should be varied and may include juvenile dandelions and different species of lettuce, though like very many plants, they should be fed rarely due to potentially harmful side effects (for the former) or a lack of nutritional value (for the latter). Water is important for all species, but the tortoise, being an arid species, will typically get water from their food, but they still need a constant supply. Tortoises should be soaked in warm water up to the mid shell. Tortoises typically empty their bowels in water as to hide their scent, this is an instinct, and it also helps keep their enclosure cleaner. Russian tortoises do not require a CITES Article X certificate. In September 1968 two Russian tortoises flew to the Moon, circled it, and returned safely to Earth on the Russian Zond 5 mission. Accompanied by mealworms, plants, and other lifeforms, they were the first Earth creatures to travel to the Moon. ^ Tortoise & Freshwater Turtle Specialist Group (TFTSG) (1996). "Testudo horsfieldii ". The IUCN Red List of Threatened Species. 1996: e.T21651A9306759. doi:10.2305/IUCN.UK.1996.RLTS.T21651A9306759.en. Retrieved 9 January 2018. ^ Fritz, Uwe; Havaš, Peter (2007). "Checklist of Chelonians of the World" (PDF). Vertebrate Zoology. 57 (2): 301–302. ISSN 1864-5755. Archived from the original (PDF) on 17 December 2010. Retrieved 29 May 2012. ^ Beolens, Bo; Watkins, Michael; Grayson, Michael (2011). The Eponym Dictionary of Reptiles. Baltimore: Johns Hopkins University Press. xiii + 296 pp. ISBN 978-1-4214-0135-5. (Agrionemys horsfieldii, p. 126). ^ "Testudo horsfieldii ". Reptile Database. Retrieved 22 February 2017. ^ "Breeding Russian Tortoises". The Russian Tortoise. Retrieved 22 February 2017. ^ "Russian Tortoise - Description, Habitat, Image, Diet, and Interesting Facts". Animals Network. Retrieved 2018-11-05. ^ "Russian Tortoise Diet". russiantortoise.org. Joe Heinen. 2002. Retrieved 2017-01-07. ^ "Tortoise & the Law". Retrieved 18 May 2016. ^ Madrigal, Alexis C. (27 December 2012). "Who Was First in the Race to the Moon? The Tortoise". The Atlantic. Retrieved 22 February 2017.
da Nóbrega Alves, Rômulo Romeu; da Silva Vieira, Washington Luiz; Gomes Santana, Gindomar (2008). "Reptiles used in traditional folk medicine: conservation implications". Biodiversity and Conservation 17(8): 2037–2049. doi:10.1007/s10531-007-9305-0 (HTML abstract, PDF first page). Fritz, Uwe; Kiroký, Pavel; Kami, Hajigholi; Wink, Michael (2005). "Environmentally caused dwarfism or a valid species – Is Testudo weissingeri Bour, 1996 a distinct evolutionary lineage? New evidence from mitochondrial and nuclear genomic markers". Molecular Phylogenetics and Evolution 37: 389–401. doi:10.1016/j.ympev.2005.03.007. Khozatsky LI, Mlynarski M (1966). "Agrionemys – nouveau genre de tortues terrestres (Testudinidae) ". Bulletin de l'Académie Polonaise des Sciences II – Série des Sciences Biologiques 2: 123-125. (Agrionemys, new genus). (in French). Alderton D (1988). Turtles and Tortoises of the World. New York: Facts on File. Ernst CH, Barbour RW (1989). Turtles of the World. Washington, District of Columbia: Smithsonian Institution Press. Highfield AC (1990). Keeping and Breeding Tortoises in Captivity. Avon, England: R & A Publishing. Obst FJ (1988). Turtles, Tortoises and Terrapins. New York: St. Martin's Press. Pritchard PCH (1979). Encyclopedia of Turtles. Neptune City, New Jersey: T.F.H. Publications. Pursall B (1994). Mediterranean Tortoises. Neptune City, New Jersey: T.F.H. Publications. Wahlquist H (1991). 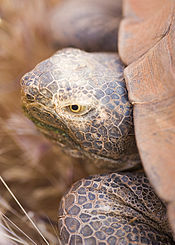 "Horsfield's tortoise, Agrionemys horsfieldii ". Tortuga Gazette 27 (6): 1-3. Wikimedia Commons has media related to Testudo horsfieldii. This page was last edited on 25 March 2019, at 15:29 (UTC).